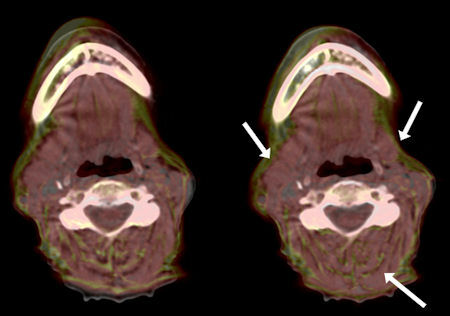 October 25, 2013 -- Hybrid PET/CT has become widely adopted across nuclear medicine, radiology, and increasingly radiation oncology. Having largely displaced conventional PET, it has the benefits of providing high-resolution anatomical localization, accurate PET attenuation correction for quantification, and rapid acquisition. Introduced more recently, hybrid PET/MRI offers exquisite soft-tissue differentiation for improved localization in areas such as the abdomen and pelvis, reduced dose, and more discriminative tissue characterization through functional MRI. Nevertheless, hybrid PET/MRI has a number of challenges to overcome prior to its widespread adoption, including continued questions around MRI-based PET attenuation correction, increased acquisition times, and lack of reimbursement. Figure 1: Comparison of CT-MRI fusion using rigid registration (left) and deformable image registration (right). Note the significant improvement in alignment of the lymph-nodes and soft-tissue boundaries. The images show semitransparent overlays where the CT (rendered in grayscale) is the base layer and the MRI is the overlay (rendered red-yellow color map). In figures 1-3, results were created using Mirada XD3, Mirada Medical, U.K. All images courtesy of Leeds Teaching Hospitals NHS Trust, U.K.
One of the greatest barriers to adoption is cost. At several times the price of PET/CT, hybrid PET/MRI systems have remained largely within the realm of well-funded academic institutions. Beyond the hardware costs, there are also indirect costs related to recruitment of qualified staff and upgrading of support infrastructure. Against this backdrop, hybrid PET/MRI also needs to demonstrate clinical benefit before greater adoption can occur. 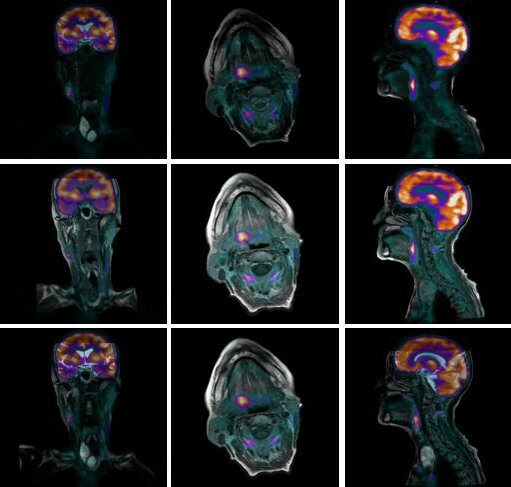 The software fused variant, PET-MRI, is an alternative technique that utilizes deformable image registration (DIR) to fuse independently acquired PET/CT and MR images. A DIR algorithm is used to align the CT and MRI scans, and because the PET and CT images are already coregistered, the same transformation can be used to fuse PET and MRI. While rigid registration-based fusion has been used for many years, it is restricted to applications such as brain imaging, for which a translation and rotation are typically sufficient to correct for the misalignment. In contrast, DIR is capable of correcting nonrigid motion, hence in principle it can be applied in all areas of the body. Figure 1 illustrates the importance of using deformable over rigid registration, even in a head and neck case. The resulting software PET-MRI is shown in figure 2. 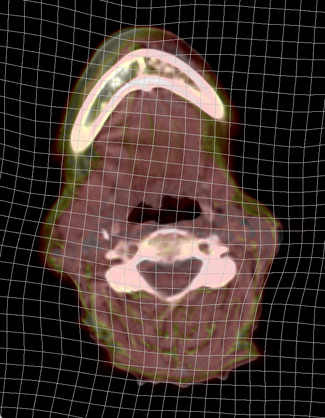 Figure 2: Software PET-MRI fusion for a head and neck case. The CT-MRI deformable image registration is used to align the PET with all of the MRI sequences. Here, all the MR images are rendered in their original orientation fused with the FDG-PET. Importantly, DIR can correct for differences in patient positioning, and so the PET/CT and MRI scans can be taken days or even weeks apart using standard protocols. Moreover, for certain diseases the acquisition of both modalities is the standard of care in many institutions, and no additional scans need to be performed. The example shown in figure 2 was generated with images acquired a week apart as part of the patient's management. A crucial step in any image acquisition process is quality control. Analogously, the quality of image fusion must be assessed prior to its clinical application. Fortunately, since CT and standard MRI sequences, such as T1 or T2, are anatomical modalities, gross morphological features, like organ boundaries, and finer structures, like the edges between tissue types, are clearly visible, facilitating visual assessment of the accuracy of the registration. For example, the user can examine the correspondence between muscle/fat edges. It is critical, however, that PET-MRI software provides tools for this purpose, including semitransparent overlays, checkerboard and inset views, and additional tools to assess the quality of the deformation itself. The resulting deformation should be free of tears and discontinuities. Representations of deformation are also important for assessing the alignment in areas of homogeneous tissue such as the liver in CT. Good-quality DIR should produce smooth motion in such areas and not create arbitrary deformations. Figure 3 shows one such display: the so-called deformation grid overlay. In the absence of deformation, the grid lines would be straight. Figure 3: Examination of the deformation grid can facilitate quality assessment by the user. The deformation should be smooth, free from discontinuities, and not contain artificial deformation in areas of homogeneous tissue. There have been a number of studies done to validate the accuracy of DIR in the context of software PET-MRI. 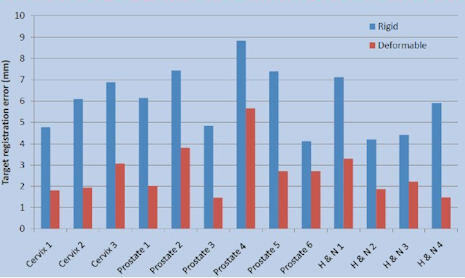 Work led by Dr. Martin Lodge and colleagues at Johns Hopkins University in Baltimore, Maryland, U.S., and presented in June at the 2013 Society of Nuclear Medicine and Molecular Imaging (SNMMI) meeting in Vancouver, British Columbia, looked at PET-MRI software registration in the context of prostate cancer (Journal of Nuclear Medicine, 2013, Vol. 54:supplement 2, p. 2089). A quantitative assessment of accuracy was performed using a catheter as a known point to measure target registration error. DIR significantly improved registration accuracy compared with rigid registration. In earlier related work, presented at the American Society for Radiation Oncology (ASTRO) 2011 meeting in Miami Beach, Florida, U.S., in the context of radiation therapy planning, 13 pairs of CT-MRI registrations, including head and neck, prostate and cervical cases, were quantitatively assessed by clinical experts for accuracy and the utility of the results (International Journal of Radiation Oncology, Biology, Physics, 1 October 2011, Vol. 81:2, pp. S812-S813). Deformable registration was found to be superior to rigid, and it improved clinical confidence. Using the same data in a quantitative assessment, it was shown that deformable registration reduced average target registration error by more than 60% (see figure 4). Figure 4: Quantitative assessment of CT-MRI deformable image registration versus rigid. Results show that average target registration error is significantly reduced. Is software PET-MRI a complete alternative to hybrid hardware PET/MRI? No, hybrid PET/MRI systems can offer reduced patient dose, logistical advantages, and the potential research applications of simultaneous acquisition. Is software PET-MRI a cost-effective alternative to hybrid hardware PET/MRI? Yes, commercially available software brings PET-MRI to routine clinical practice using existing hardware at a fraction of the price of hybrid systems. Furthermore, software PET-MRI has the potential to be an efficient and clinically viable modality in its own right. Timor Kadir, PhD, is chief science and technology officer at Mirada Medical in Oxford, U.K.
Dr. Andrew Scarsbrook is a consultant radiologist and nuclear medicine physician at Leeds Teaching Hospitals National Health Service (NHS) Trust and honorary clinical associate professor at the University of Leeds in the U.K.
Thomas Beyer, PhD, is a professor of physics in medical imaging and deputy head of the Center for Medical Physics and Biomedical Engineering at Medical University Vienna in Austria.